Cakes can be formal, casual, funny, goofy and everything in between. Right from celebrating the day you were born to moving to a new place, to parting ways, to meeting again, to celebrating being together – a cake seems perfect for any occasion in life. So for the Kid’s Delight Anniversary party, I am here with a big bunch of cakes. The same cake can be presented in so many ways. Every single one of the cakes in this post is already present in the blog. These are my to-go cakes. But every time I make the same cake again, they take a different avatar. One of the most used cake recipe for me is the eggless vanilla cake. The first cake is the same vanilla cake with fresh cream frosting here. The second cake I use most is the eggless chocolate cake recipe. The smiley cake and the basket ball jersey cakes are the same cake recipe, baked as cupcakes and mini cupcakes. The supplies in US makes cake decorating a lot easier than it is in India. The cupcakes are decorated with ready made frosting and fondant. The ready made frosting is interesting for the first couple of cakes, but now I find the taste repetitive and hence boring :D.
Ready made fondant makes decorating very easy. The food marker pens made it extremely easy to just draw the smiley faces, basket balls and jerseys. It was so easy that my son helped me with a whole bunch of them. 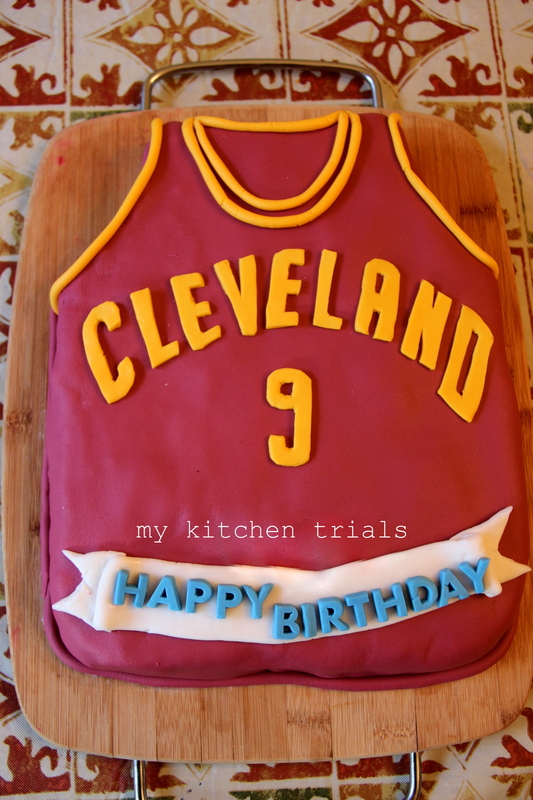 The oft-repeated cake with eggs is the hot milk cake and the Cleveland cavaliers jersey cake is just that. The cake has chocolate ganache frosting and fondant for decorating. 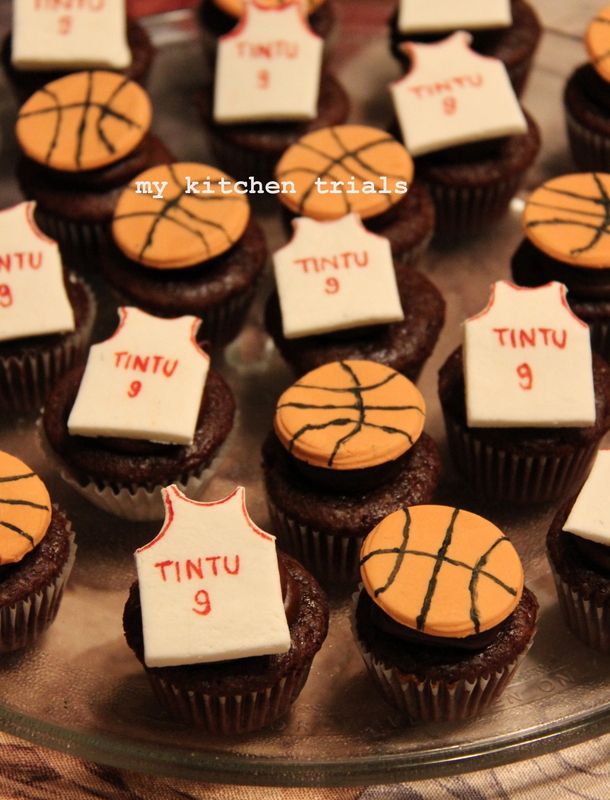 Perfect for celebrating a basket ball fan’s birthday! 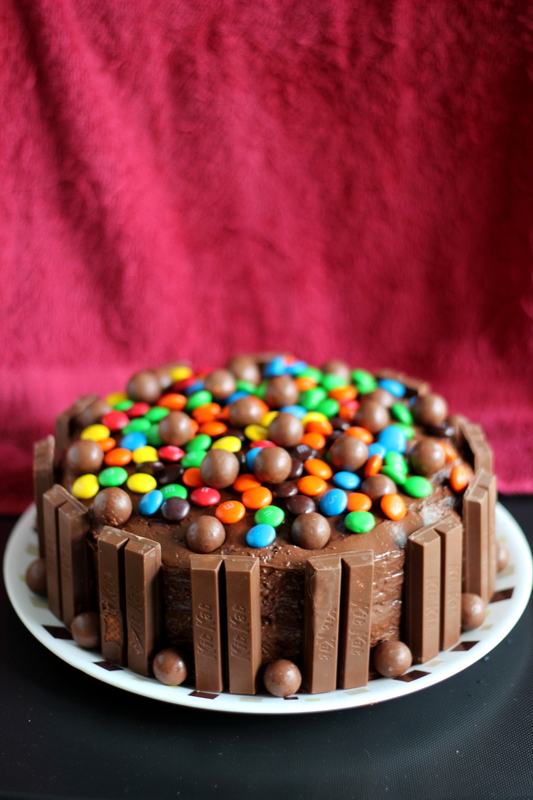 The kitkat cake is special, because its proof of how easy it is to bake a cake in US. It was baked a day or two before we moved into our current apartment and everything in the kitchen was already packed in boxes. Yet, all I had to do was buy a ready made box of cake mix, use and throw aluminium pans, a can of ready made frosting and some candies for decoration. I just wish I had picked up one more bar of kitkat, that would have made it perfect by hiding the imperfections in frosting. Well, I had to use a plastic knife to spread frosting, you see :D! 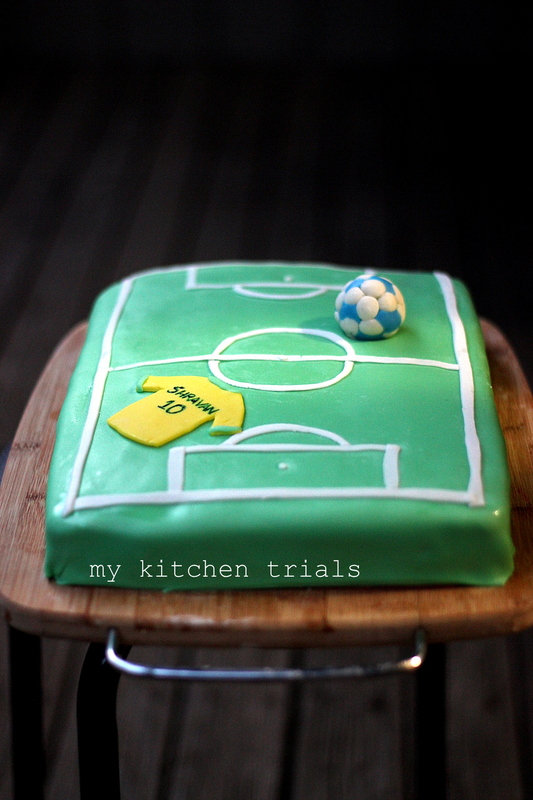 My favorite chocolate cake recipe with eggs is used for the below football pitch cake. The cake is decorated with ready made fondant from Wilton. With ten candles all around the cake, it looked a lot less empty at the time of cutting. This post goes to Valli’s Kid’s delight – Anniversary special. This post is also part of 57th edition of Blogging Marathon. Check out the link to see interesting posts from participating bloggers. What a wide variety of decoration. You are an artist. delightful and eye catching cakes……. Always enjoy your cakes Rajanai..so much art and love goes into making them..thank you for bringing in the cakes! Amazing cakes and each one is very prefect..brilliant job Rajani, especially that kitkat cake is really terrific. Wonderful job Rajani.All the cakes looks so perfect like pro .You are a pro baker ,you should start your own venture.